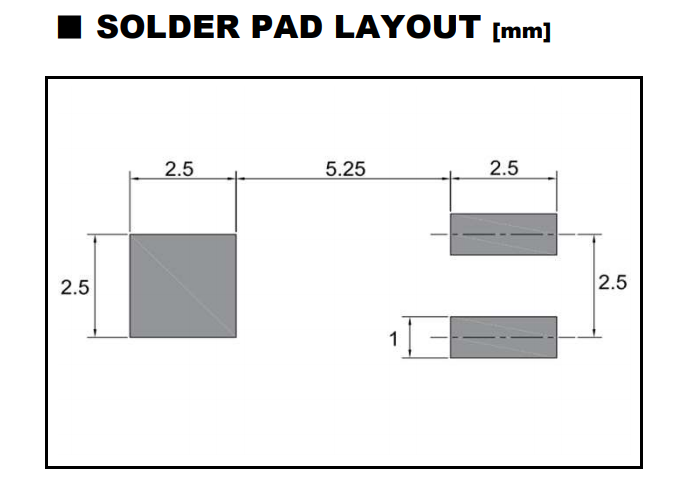 I am looking to use this crystal in an upcoming design and I am a little bit confused by the datasheet. What is the purpose of the large pad on the left? Should this be connected to my ground plane? I assume the two pins for the crystal are on the right. Primary reason is structural to prevent crystal mechanical shock and vibration damage or fatigue. Since the Xtal is electrically isolated from the metal cylindrical case, it does not need an electrical gnd. It is just like the thru-hole parts with a wide can and very short leads where the can is electrically floating above the PCB surface. If 0V grounded, the added sub-pF stray capacitance load might reduce the frequency of x ppm which may be in the range of your average load-cap tolerances. Many large pads like those are used as grounding points; you could solder the case to it, or you could leave it as is. It provides a point that you can use as a ground for later use. You will see alot of these in consumer electronics such as laptops; chassis points are often connected securely to the mobo ground, which is why you can use chassis as ground in most cases. Not the answer you're looking for? Browse other questions tagged pcb-design grounding surface-mount crystal or ask your own question. How do I connect the certral pad of a QFN24 to the Ground in Kicad? What are the plated holes on this PCB for? What is the pad size required for this BGA AW H3 Chip?